Visual communication from Mooreco, or Best-Rite, has been a leader in the educational and commercial markets for visual communication products such as whiteboards and bulletin boards for over 40 years. Wall mounted writing boards come in a variety of surface options that can be used in all sorts of applications. 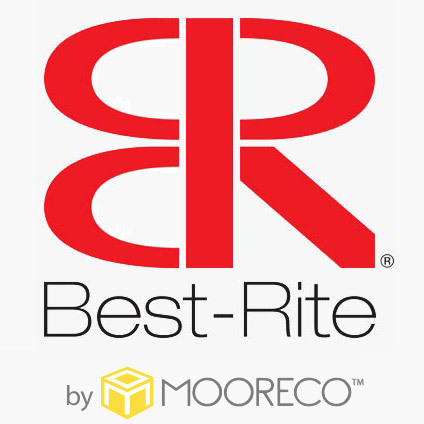 Best-Rite carries the full range of dry erase boards with surface options that include Dura-Rite whiteboards, Magne-Rite whiteboards, and the top of the line porcelain steel whiteboards. Each surface serves as a good, better, best option for not just wall mounted dry erase boards, but mobile easels, reversible whiteboards, graphic dry erase boards, and conference cabinet boards. Beyond classroom whiteboards, Best-Rite produces visual display products such as bulletin boards, art display panels, and classroom display strips. Bulletin boards come in many options from the standard cork board, to vinyl covered tack boards, anti-microbial surface boards, to free-standing tackable surfaces. For the professional office setting, Best-Rite carries some stylish board options such as their Visionary glass dry erase board, projection plus porcelain steel whiteboards, and the Elemental self-adhesive dry erase board. As technology moves into the school classroom, Best-Rite has also moved into the technology display market with their line of interactive whiteboards and interactive board stands. Portable signs and enclosed message boards give your visitors direction, while their display cases show off your achievements. While they have lost their popularity over the years, Best-Rite does make a variety of chalkboards for use in the classroom and commercial spaces. For eco-friendly boards, Best-Rite makes a Green-Rite whiteboard and their popular Rubber-Tak bulletin boards made of recycled rubber tires. Support products such as dry erase board cleaner, dry erase markers, whiteboard erasers and display map rails are all available from Best-Rite at great wholesale prices. Choose Best-Rite as your complete visual communication board and display provider for school, office, church or retail. Source classroom, office, soft seating and makerspace furniture products from their sister company, Balt.